My name is Sonja Ramseyer, also known as Psydrache and I live in Switzerland. 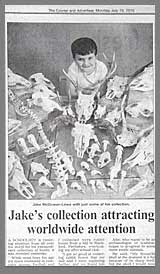 I have collected skulls and bones since I was a small child – a strange hobby for a girl, I know. But by doing so for many many years a lot of stuff came together. Most of it was found by myself. Other things were gifts from my friends and relatives. And some skulls or horns I bought by taxidermists. Note that I always have an eye on where the skulls actually come from – because I always want to buy my stuff on the legal way. But even if you can get amazing stuff from taxidermists the self-found skulls are always the most beautiful ones. When I’m bored I often surf in the internet, seeking for interesting pages about skulls and that stuff. By doing so I found a page where you can buy skulls of arctic animals which was also including narwhal tusks! Well, you can imagine that these tusks are very expensive, so I only saved the page to my favourites. After a few months when I had a rough time in my job, I lost my best friend. That was hard and I got very depressed. 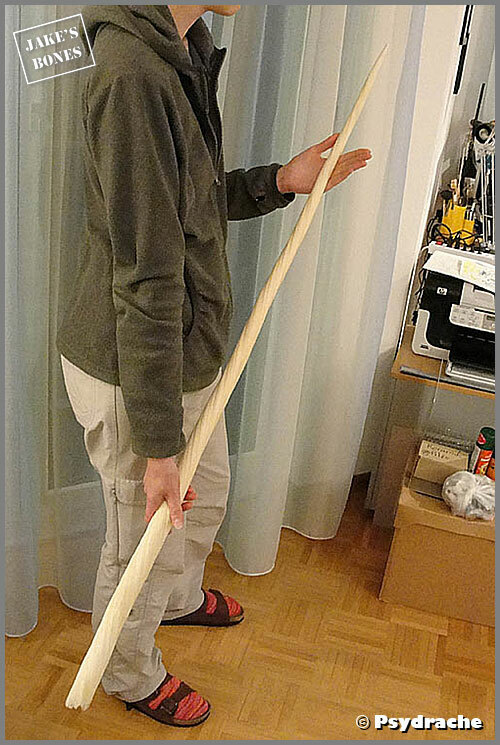 To lower my frustration I went back to that homepage and ordered the smallest narwhal tusk they had. That was the first time which I had to request a CITES paper – which was a real experience by itself. think that’s something special, because it is nearly impossible to find by yourself! By the way, that particular narwhale was killed by Inuit people, so I don’t have bad conscience. My name is Emma Carpenter. My husband Bill and I are from Kansas, a state right in the middle of the United States of America. We live in an area called the "Flint Hills," a hilly, rocky area famous for its exceptional grazing land. The cattle industry is huge here, and is still largely worked everyday by cowboys and cowgirls on horseback, including me and Bill. 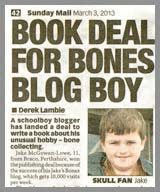 I have always been a bit of a bone collector: when I was a kid I dragged home every bone and skull I found in the fields and tried to figure out what it was. When I married Bill we began raising Texas Longhorn cattle, and it was only natural to collect their skulls with their long, twisting horns after they had died. Collecting a skull is actually a rare occasion for us. We try very hard to take good care of our cows and seldom have one die on us. But, occasionally a death we can't prevent will happen and then we have a beautiful skull with long, fancy horns to keep. Several years ago we found one of our cows dead in a pond. Although she was very old we were still upset and surprised she had died so unexpectedly. We tried to get her body out of the pond, but she was too far out. Her body wound up staying in the pond for two years before a drought struck our area and the water level went down. When the water was down far enough I was able to get to her skull and several other bones to keep them. By now her skull was badly discolored, and had large areas of black and brown stains all over it. Not knowing how to clean a skull in this condition, I put it in a shed for safe storage where it stayed for another two years. About four years after the cow had died I decided to try to whiten the skull. 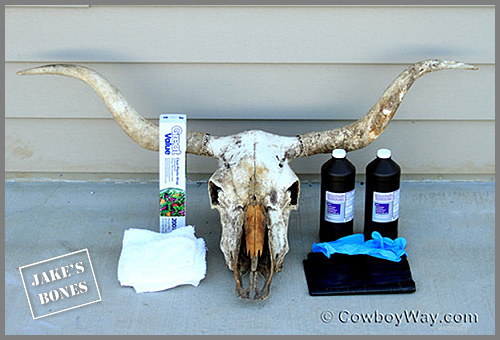 After some research, I soaked white rags with 3% hydrogen peroxide and placed them all over the skull. (It was important to use white rags because hydrogen peroxide bleaches colors out of cloth. If I had used colored rags the peroxide would have drained the color from the rags and let it soak into the bone.) Next, I wrapped the skull and rags with kitchen plastic wrap so the peroxide wouldn't evaporate. Then I put the whole thing into a black plastic garbage bag and set it in strong summer sunshine with the temperatures over 100 degrees Fahrenheit (37+ degrees Celsius). After one day, the improvement was dramatic! That evening I rinsed the skull with water and let it dry over night, then repeated the steps the next day. After the second day, the improvement went from dramatic to amazing! Most of the skull had turned to a nice, bright white. There was only a little bit of light brown on the nasal bone remaining, but our nephew had asked for the skull and wanted me to leave it like that. He felt like the skull had a story to tell, and thought the slightly brown nasal bone helped tell the story. So, after setting the teeth with glue and sealing the bone with a couple of light coats of polyurethane spray, I gave the skull to him. 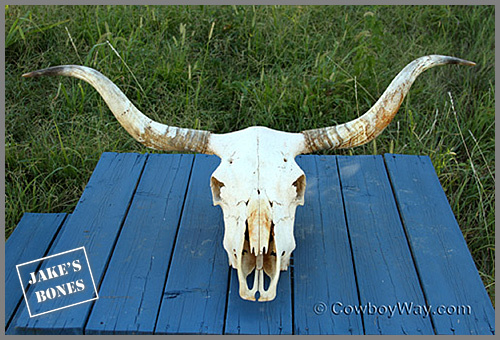 It's the only Longhorn skull we've ever given away. Even though I don't have this skull anymore it remains one of my favorites. Because of it, I learned a little bit about cleaning stained bone and was so excited and happy when my efforts paid off with a nice, white skull. 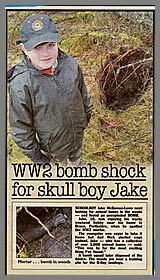 Thanks for reading about my skull, and I'd like to say a special thanks to Jake for allowing me to share my experience with you on his blog. The giraffe is the largest skull in my collection. These incredibly tall beasts are herbivores, they use their long tongues as a hand to pluck leaves from the tops of prickle covered trees. Surprisingly the long neck of this species has the same amount of bones in it as you or I but the vertebrae are huge. Baby giraffes have a bit of a bump at the start of their lives as birth happens while its mother is standing. 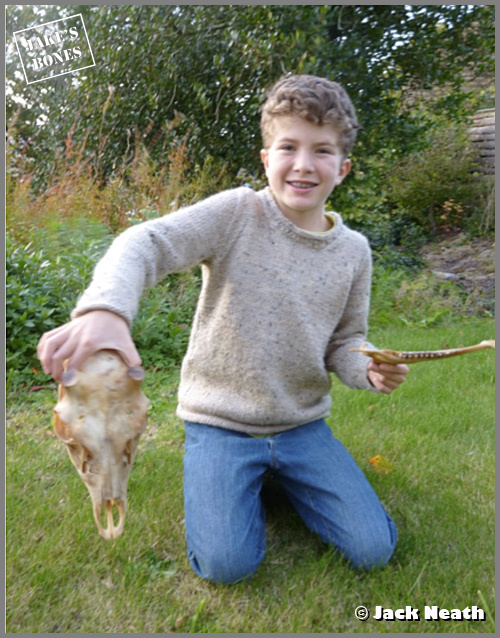 My skull measures 700mm long and weighs 10 kilogrammes ! 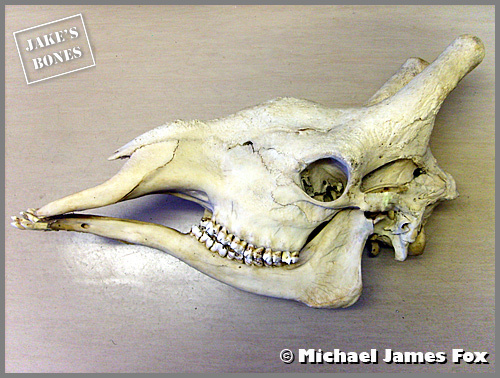 This skull is probably my favourite for its size although my Indian water buffalo and long horned steer skulls are also pretty big, also I think that it would be very hard to get another one. I was lucky enough to buy this skull on the internet as I have done with a few of my more unusual skulls, adding to my collection of around 1,000 skulls, i also have several skeletons that I have cleaned up and articulated, including a salmon (dont recommend this to anyone, its very fiddly) duck, roe deer, squirrel, several fish, pheasant, rat and a few more. Like Jake I started at an early age ( I was 5 years old) when I found and identified my first skull, it turned out to be a zebra finch which I accidently dug up in the woods behind the house we were living in at the time, I still have this skull today. 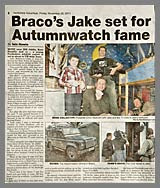 Now in my 30s I decided to write and publish a book on my collection and I am sure that Jake may do the same in time. I now live in a small town called Rosyth which is near the Forth road bridge in Fife so I can explore the beaches and woodlands in the area in the hunt for more bones, every now and then I might come across something unusual such as the common porpoise that i found on the beach, it was a cleaned skull although it was broken, after cleaning it a little more, rebuilding it and identifying it I obtained a licence to keep it and it now joins the other few hundred species in their padded boxes. One day I will have somewhere to display them all but they do take a lot of room when out of the boxes ! 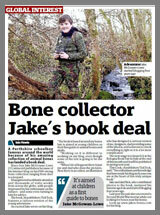 Michael's great guide on bone collecting is on Blurb. Hi guys! 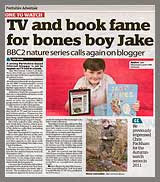 My name is Jack Neath and I am an 11 year old bone collector from the little town of Matlock in the beautiful county of Derbyshire. I’ve always been into some form of wildlife, be it enormous dinosaurs or tiny spiders. I was always curious to find out about all the inner workings of an animal, what incredible things went on under the skin. 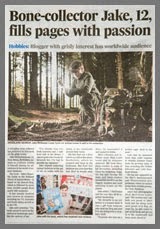 So when the chance to get a hands on experience into this, I gladly accepted. A POACHED FALLOW DEER SKULL ! I found it when I went to Cannock Chase in Staffordshire, one of the UK's deer hotspots .I had gone tracking with my twin sister Jess, and was about to go back when we found a wide cycle path which led back to the campsite we had stopped at. I thought we should follow the path back, but Jess disagreed and thought we should go back through the thick forest. After a heated argument Jess won me over with the old "we might find some booooones..." trick; I always fall for it.But, for once, she was right. When we had just come off the path, she grinned, “Or we might find a skull,”. I don't know what it was, perhaps the look in her eyes, that told me that she had found something awesome and I "totally owed her big time! ", to quote her. I rushed over, as excited as a toddler on Christmas day, and literally jumped for joy as I saw the skull. It was a male, I could tell, yet its antlers had been sawn off by a poacher. 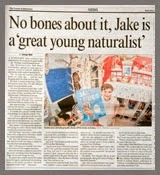 At the time, I thought it was a sika skull. It was only once I had cleaned it up that I noticed it had no canines, so could only be a fallow skull. I know it was only just an adult when it had died by the fact its adult teeth had just come through and were not worn down. This was a very exciting find and I hope to work out more about it in the future. I would love to get in touch with another bone collector, so if anyone wants to contact me, my email address is jackneath@uwclub.net ,and I guess that's me done. Bye guys! @Psydrache: thanks but I didn't put them in a particular order ! @Anon: NEVER rot down fish...the smell is DISGUSTING ! Anon: cook the fish. One of our osteology guest lecturers says she does it all the time. Either in the oven or on the stove (in water, sometimes with bio detergent), depending on the size. Smells just like fish soup!